While poking around a local gunshop about 4 years ago I found a 1943 Colt 1911A1 with a GI replacement slide. The gun showed years of use, but not abuse. The blue refinish was all but gone and the barrel was shot out. What made this ugly gun attractive was that the lower appeared to have all the correct, if not original, parts for a 1943 Colt, and the slide was uncut and had it's original front blade and rear sight. There was no way this was going to be a collector piece, so I could do no harm. I figured that the old war horse deserved a decent retirement, and that it could be made into a nice plinker and conversation piece. It was fitted with a Jarvis barrel, a spherical bushing, a full-length guide rod, new springs, the trigger was cleaned up and the slide/frame fit was tightened. Mark Graham of Arizona Response Systems applied his "classic patina" finish. The final touch was a set of period checkered brown plastic grip panels. The result was a tasteful restoration of a WWII 1911A1 with a few modern updates. It looks like a '43 Colt on the outside, but it's as accurate and dependable as any modern .45 I own. Actually, it's my favorite. It's not a collectible, but it isn't a reproduction either. Point is, if you want a WWII-era 1911A1 shooter and can't spend for an original condition speciman, consider scouring the gunshops and shows for relics that can be restored and enjoyed. BTW, I spent WAY too much on this project. The beater 1911A1 cost $450 (it was worth $250 by any standard at the time, I later learned) and the restoration was another $450. This was before the repros appeared. No regrets, though. Edited by 6086, 13 June 2004 - 09:34 PM. Might check out the 1927 one on the top link. DO YOUR RESEARCH! There are lots of web sites that cater to the 1911A1 enthusiast. Once you know what to look for you can make an edjucated purchase. There are lots of 1911s out there, finding one you will be happy with at the price you can live with is the key. Collectors Firearms in Houston had at least a half a dozen authentic ones last time I was there with the matching prices. I got a Colt made in Oct 1918 and WW1 proofed, reworked for #2 into A1 for $800. Didn't take too long for me to make up my mind on that one. Good luck on the search. My father-in-law was a WWII vet of the Pacific campaign and recently before he passed away gave me a 1911A1 he smuggled back. It has some unusual markings. It is an Ithaca marked "Ithaca Gun Co. Ithaca, NY" on the left side of the slide, and "United States Property" and "M 1911 A1 US Army" on the right side of the frame. But then it has what I assume are British proof marks on the barrel, slide, frame, along with "Not English Make" marked on the slide and frame. I haven't had time to look up info on this piece, but I'm assuming this was a lend lease pistol. My father-in-law was in the Signal Corp with the 3rd Marine Division and stationed on Guam. He was very good working with his hands and made some beautiful custom knives while in the service which he traded for souvenirs. A British soldier was happy to swap his pistol for a hand made knife made of leaf spring steel and wild boar tusks. When I get time I hope to find out some info on this 1911A1. Got out bid in the last 50 seconds while I was at, you guessed it, church! Here's a Colt/Remington Rand rebuilt gun for $975. I had a post war arsenal rebuild Remington Rand for about ten years, but I sold it about five years ago. It had a colt 1911 frame and trigger, but a Remington Rand 1911a1 slide. Most of the parts were a1 parts. I know the frame was a colt after I checked the sn in a Flayderman's (sp.?) book. It was worn, but it shot great. 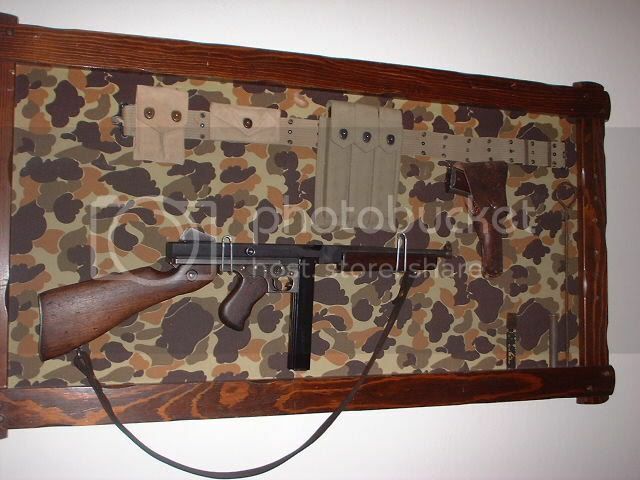 I still have my WW2 issue pistol belt and holster. One of these days I would like to get one of the nice inexpensive replicas being made now to put back in the holster. I now have a S&W 4506 45 cal. pistol. I am very happy with it, but it does not go with my Thompson. My Thompson needs a companion. My father-in-law is supposed to get his father's 1911 when he passes. I have seen it, and it is nice. I believe it is a colt, but I have not seen it in years. Maybe one of these days I may get to shoot it. I see one common thread here...`I had but sold`theme...I guess I`m lucky cause I never sold any .45s...still have the first Ithica for 30yrs,Colts,US&S,Remington/Rand...still got`em,almost had a Singer from a retired Singer employee who became a range officer at the local club...used to shoot it often...what a treasure...I think they buried it with him...Bill Douglas has a .45 torch cut on one side at the NASLEEM Museum he acquired from someone that worked a summer job as a kid scrapping these pieces of history....our leftist libby government at work!!!,out. These are righteous pieces Union Switch & Signal. Oh I'm way ahead of you Phil! I've got a rebarrelled Dec-42 Springfield Armory M1 that is a great shooter plus a Collector Grade post-WW2 H&R. Along with a M1903 and M1903A3. All from the CMP. Best firearm deals on the planet. 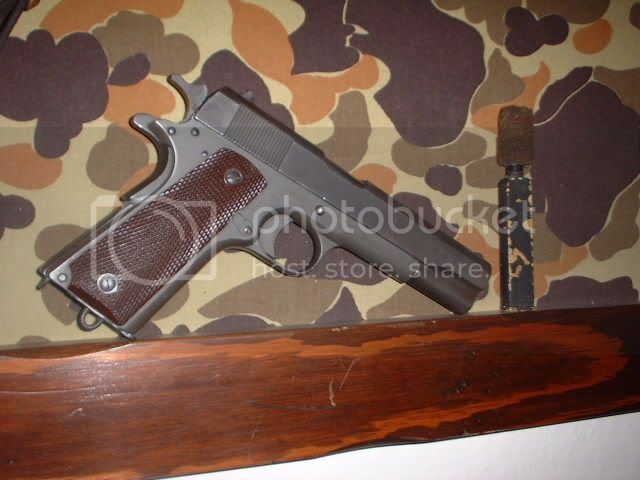 Check out GUNBROKER AUCTION #19540276.Remington-Rand 1911a1 BUY IT NOW $1075. Currently at $350.00,12 days to go. Yep, that was the price back then from the DCM of yesteryear. Here is a great story related to me by my old CPA. He asked that I come down to his office one day to look at an old 1911A1 that he had purchased through the DCM back in about '61. He was kind of concerned that being an old pistol, it may not be too cool to shoot it. He reaches into his desk drawer and pulls out a Kraft box with a pristine Colt 1911A1, paperwork and all in it! After a thorough inspection (all original mint) I tell him that I was sure that it would be fine and that if he ever wanted to sell to please keep me in mind. He says that he would and that he might just double his money on it - being that he gave $17 shipped for it! He went on to say that he really wanted an M1 Carbine that they offered also, but that it was going to cost him around $35 for both of them back then and he just could not afford it at the time. I gave him a standing offer of $1000 for the Colt on the spot. This was only a couple of years ago so I thought I was being fair. The old fellow was in the TNG with my father when they were activated for the Berlin Crisis. Edited by Tex, 16 June 2004 - 04:18 PM. I'm watching it. However, this pistol is nowhere near as nice as the one that sold for $975 Sunday night. 1911's are worth so much they are faked. Email me and I will tell you all about it. Better yet, let's chat about it sometime.